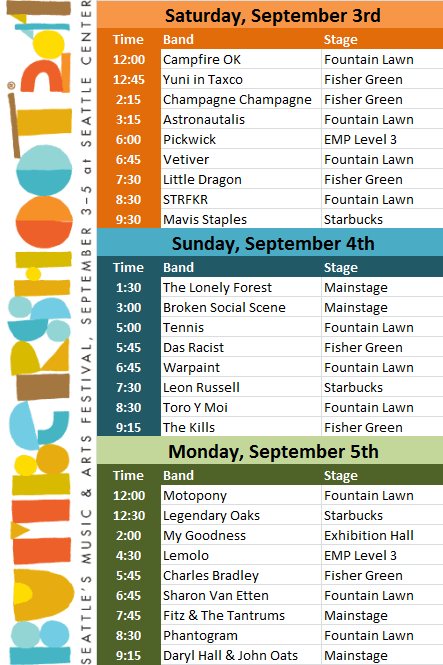 After lots of meditation and inner turmoil, we’re happy to finally share our recommended sets for Bumbershoot 2011! If you’re looking for good music, look for us at these sets. (Keep scrolling for the clickable list.) We’ll also be hanging out at the KEXP Music Lounge for intimate sets with some of our favorite artists of this year’s fest, and you’ll also see us ROFLing at the comedy stages. Stay tuned for some more info on our favorite bands as the weekend approaches and keep refreshing the site throughout the weekend for photos and other festival highlights.